Albuquerque Beer Scene: Sam Gose Wild! Things must be going pretty well at the Boston Beer Company. It may have something to do with those Samuel Adams commercials, thanks to which I can't hear "Who Do You Love" without thinking of their beer (and changing the station). They aren't just sitting around smelling hops and growing beards up there- they are experimenting with everyone's favorite styles: Sahti and Gose. Norse Legend brings the rich Finnish tradition of Sahti to us. You gin lovers out there might be fans of this style: it is abound with juniper, but not in the way that had everybody crying over their allergies not too long ago. 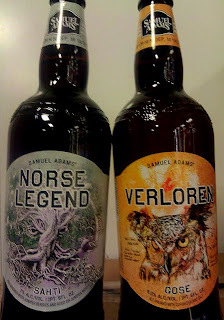 Norse Legend is aged on juniper berries and is 7% ABV. Though German in style, I don't recommend drinking this beer out of a boot: Verloren is a 6% ABV beer in the Gose style (though 6% is higher in ABV than many of the Gose beers you will find at Albertsons. Gose uses a heavy proportion of wheat in the mix, along with coriander and...salt. No more need to keep that shaker in your purse, New Mexican ladies! Both of these styles are selling at the Kelly's on Wyoming for under $7.